The photos from current Oysters enjoying their summer in exotic locations are flooding in! Summer is one of our busiest seasons and it’s great to see so many people using their holidays to do something worthwhile and adventurous. Here at Oyster, we like to be prepared to help with those holiday blues. As the cold weather begins to creep back in, we all need something to look forward to. That is why we are freezing our prices until the end of September! Whether you want to head to Malaysia to volunteer with orang-utans or to South Africa to coach sports, there are plenty of ways to fill your summer in 2017. For some, it may seem too early to book, but there are plenty of benefits to thinking ahead. Firstly, you can secure a place on your dream programme and have something to look forward to through those cold winter months. Summer is exceptionally busy and booking early avoids disappointment. For those applying to university, it is an excellent idea to book early so that you can write about your plans in your UCAS application – a sure way to may your personal statement stand out. Most importantly, booking now means that you can ensure that you book at the best possible price. Do you love planning ahead? 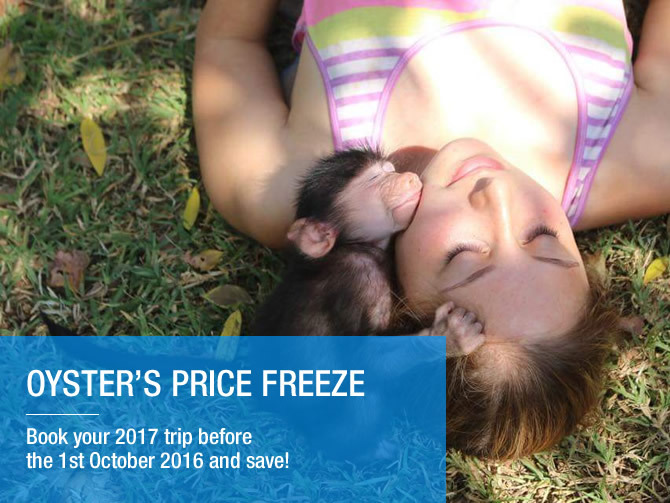 If you are keen to get ahead of the crowds, why not use this price freeze as an opportunity to book for next winter. If you are a skier or snowboarder, this is the perfect time to book yourself onto one of our many Canadian winter seasons. Remember – you will need to get a work permit so booking early gives you the best possible chance of being successful. For those who like to leave it last minute, grab your opportunity to book an exciting getaway. You could gain a TEFL in Thailand, intern in China or head to Chile to teach. This is a perfect excuse to act on your impulses and to change a dream into your reality. For ideas on how you can make the most of 2017, check out our website for great travel ideas.